Join the premier network for Hip Hop culture! Share your beats, rhymes and concert audio, photos, videos and links. Share your experience with a community that understands you. 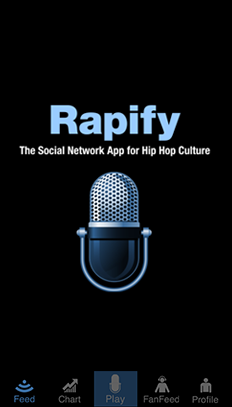 Rapify is the Premier Social Network App for Hip Hop culture. Packed with cool features this unique app was built with hip hop enthusiasts and artists in mind. 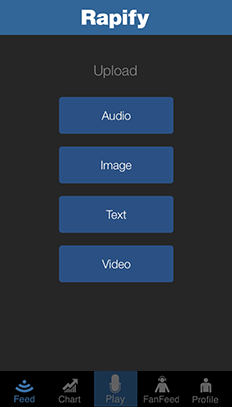 Quickly record videos of your beats and bars, take pictures of your gear and gigs, text updates about your progress and events, and then instantly share them with the community for comments and applause. Build out your network of fans and follow your favorite artists. 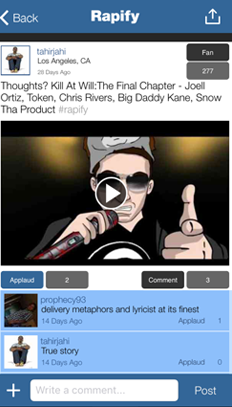 The Rapify app is an exciting, simple and fun way to share your events, audio and news with a Hip-Hop-centric community. 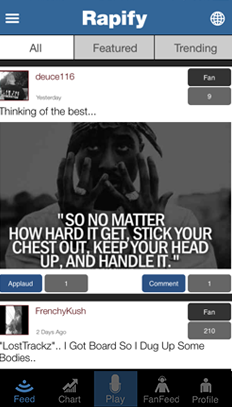 "Finally a easy to use Social Network for Hip-hop heads & fans! I haven't been this excited since MP3.com." 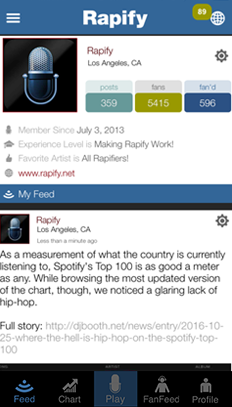 "The Hip Hop community needs a app like Rapify! It will keep us all connected."